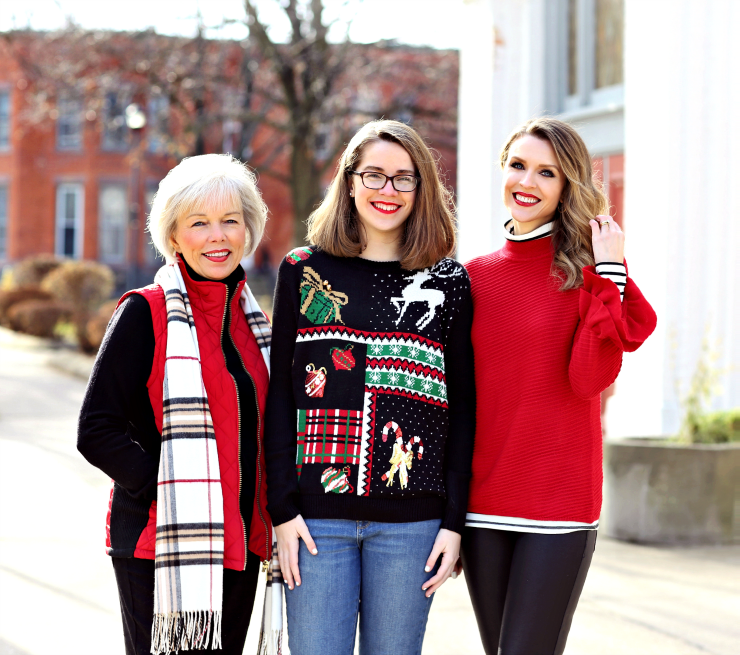 Since my parents are in town staying with us for the next few weeks, I wanted to take advantage of this rare opportunity & share 3 generations of holiday style with you today. 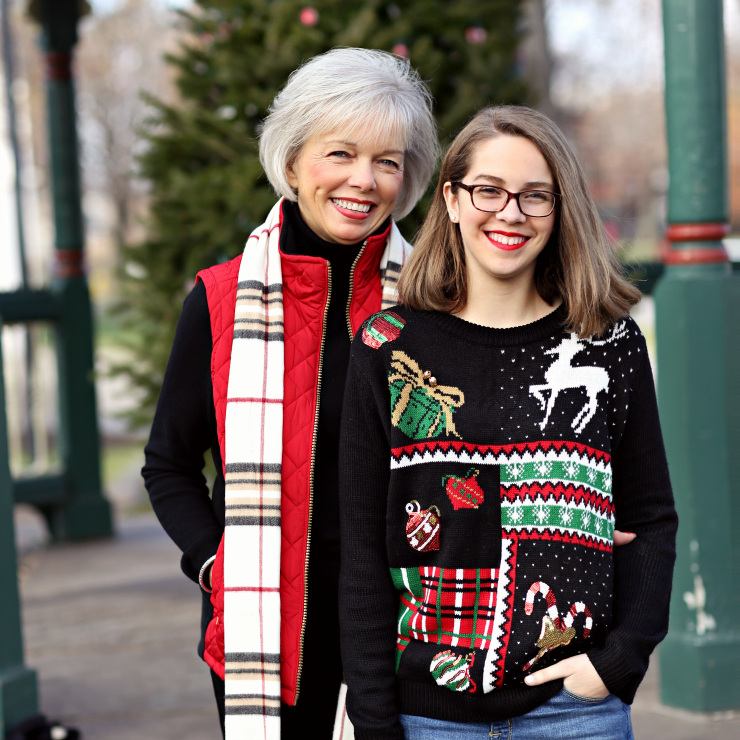 It is a true joy to get to include both my mom & my daughter in this post with me and I am thrilled that we will have these pictures to cherish for years to come. 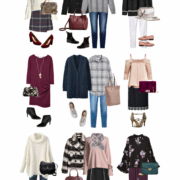 My mom is the one who has had the most influence on my personal style…and being that she’s also one of my biggest supporters, it’s only fitting that she be featured here at least once! I feel so blessed to have a mother who is my best friend & I’m beyond grateful for the positive role model that she is for my daughter. Even across the miles, she is intentional about connecting with my kids & encouraging and supporting them. She will be turning 70 next spring and her style has always been very classic. After back-to-back surgeries last year, she lost 15 pounds & needed some new clothes that fit her better & flattered her shape. Living in Oregon, she often doesn’t need a heavy coat…but she loves to layer, so this quilted vest was a great find – it comes in 8 different colors & kept her toasty warm all day long. She also picked up this cashmere turtleneck that she can wear over & over all winter long (we recommend sizing up). My daughter turns 14 today (happy birthday, sweetie!) & I could not be more proud of the kind & compassionate young woman she is becoming. She just made the high honor roll at school & landed a part in the spring musical – she’s so talented and I can’t wait to see how she uses her gifts as she gets older. I love to watch her slowly develop her own personal style, which is very different from mine! All her friends are into the Christmas sweater trend, so she was dying to get one of her own. She loved the patchwork pattern & subtle embellishments on this pullover & can’t wait to wear it to school for their class holiday party. She also begged me for these suede booties, which have a more significant heel than what she’s worn in the past – but she loved how comfortable they were. Now that I’m 39, my style has definitely become more sophisticated – I have fun trying out new trends & I think I have a pretty good grasp on what works for me. I typically gravitate towards polished styles with a modern twist, like this mockneck sweater. The ruffled sleeves give it an of-the-moment feel and the classic red hue is ideal for the holidays. I layered it over this striped turtleneck (a staple in my wardrobe!) & paired it with some plaid shoes for a festive touch. 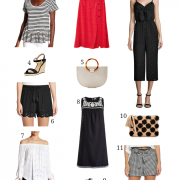 Thank you to Lord & Taylor and ShopStyle for kindly sponsoring this post. All opinions are 100% honest & all items were hand-selected by us. I love all three of your looks, they’re all age appropriate, complimentary to each other without being too matchy. Thanks so much, Natali – it was a lot of fun! What a beautiful and uplifting post! You are all beautiful ladies and your outfit selections are perfect! I’m sending a picture of your mom to my sister who needs a new hairstyle (she says!) What a blessing to all be together like this, it is truly what Christmas is all about! Aww, that will make my mom so happy to hear – she has actually had the same hairstyle forever, but I think it looks great on her! Great post. It was nice to see three looks for women of all ages. I’m sharing the post with my mom. Such a beautiful family! Hope you guys have a wonderful Christmas! 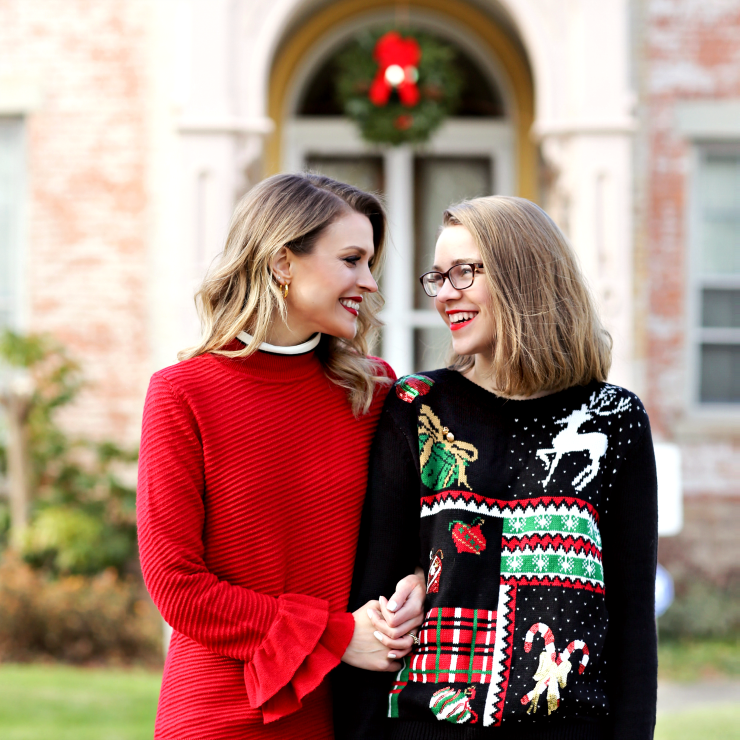 Great holiday outfits! This is such a great post! You have a wonderful blog!! Thank you Dianna – I appreciate you taking the time to comment! Three beautiful ladies! Enjoy your parents visit they are precious times. I lost my dad earlier this year and missing him terribly this holiday season. Time goes by too fast to miss out on these special times and having these pictures to look back on in the future will mean everything. Happy Holidays!! I’m so envious! Before we moved away from Oregon, I also lived within 15 minutes of my parents and it was such a blessing! Your mother is so pretty…. she dresses exactly as I do! AND I love her dimples!! so cute. Aww, thank you – I will be sure to tell her that! I also love her dimples and am a little disappointed I didn’t inherit them! All 3 of you are beautiful ladies!! And you mother looks great!! This is a sweet post! Thanks so much, Rach – I also think she looks amazing for being almost 70!! I am SO in love with these photos and these women who are clearly beautiful inside and out. LOVE seeing your mama on PPF! Gorgeous outfits. Happy holidays! Thank you – wish I could feature her here more!! I agree – and I will tell her you said so! It’s awesome your parents could be with you and your family for Christmas! These are beautiful photos of 3 great ladies. Bless you all! I love your blog and this post is my favorite! It is just adorable! Happy holidays! Congratulations on your daughter. What a lovely post anf how great to have such a relationship with your mother. These photos are so sweet! Somethng you can look back on down the road and smile. Talk about a gorgeous family ! Aw love this post! Yall look gorgeous! What an adorable post! You all look so cute! Aw this is so cute!!! And you all look amazing!! such gorgeous ladies! i loved this post! Well if this isn’t just the cutest thing ever! Great looks! All three of you look gorgeous!! I’ve been following along for a couple of years now and your daughter has really gotten tall! She’s a beautiful young lady! Yes you are so right – she is the tallest one in her class & just passed me up! What a gorgeous three generations! Loved reading this post. okay this post is adorable! Y’all are gorgeous women! I commented the other day that I was going to send the picture of your mom to my sister who wants a new haircut. She loved your mom’s hair so much that she printed out the picture and is taking it to her hair stylist. I had a feeling she’d go for it, it seems like just what she was looking for! Oh I love hearing this – I will tell my mom!! This is so sweet! Loving all the pops of red! And I seriously love L&T, there’s one right near me. You three are absolutely adorable. Love this! You all look amazing. This was so cute, loved this post! I love your daughter’s glasses! I don’t know whether you spend much time looking for glasses, but a prescription pair that is stylish and within budget is so difficult to find! If you have any tips for finding a good pair at a good price, I’d love if you would share in a future post. Thank you! We actually got this pair at JCPenney and they’ve ended up being more durable than the Kate Spade glasses she had before! All three of you look so sharp! I lovelovelove these photos of all of you! OMG all the feels! First, congrats to your mom on the weight loss. Happy belated birthday to your daughter! And — you’re a mom to a teen? Girl, you are stunning! 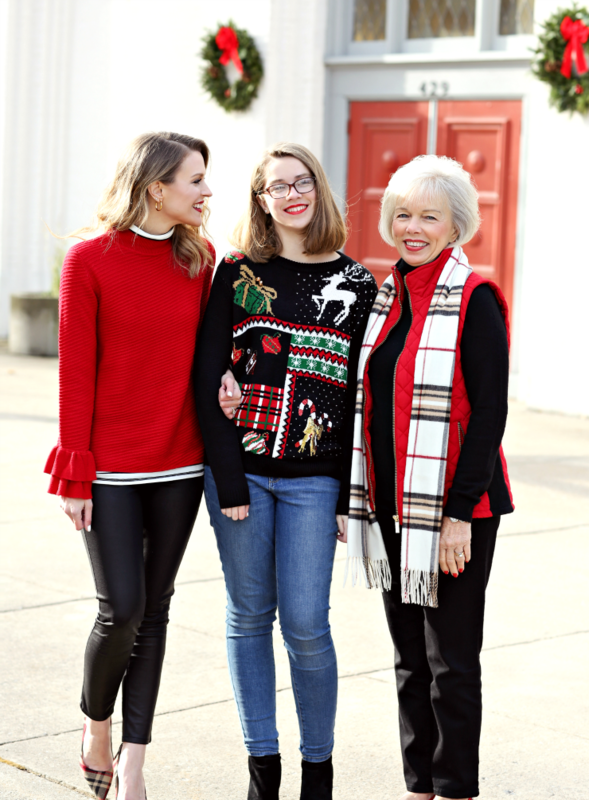 I love the three generations of holiday style. You all look amazing! 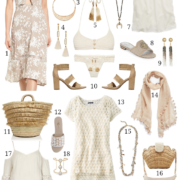 Love your holiday style and happy birthday to your daughter! Aww, I love this post so much! Happy Birthday to your daughter! and your entire family is beautiful!! Awww how sweet! I cant wait to do this with my daughter! This is such a fun post! You all are so gorgeous! Such a sweet post and a memorable one! This is so sweet! Your mom and daughter are too cute!